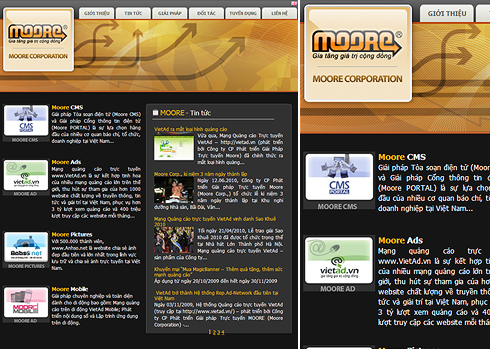 Established in 2007, Moore is an online content and advertising company with a first-mover online ad network (VietAd), a pioneering music streaming portal (Nghenhac.info), the leading photo storage and sharing site (Anhso.net), and flexible content management system solutions for online publishers. VietAd is the first ad network in Vietnam, providing contextual ads with an easy-to-use monitoring and tracking system comprised of over 1000 publishers in 51 online channels. Nghenhac.info, established in 2003, is the first Vietnamese music streaming website, with 1.5 million users. Anhso.net is the leading photo portal in Vietnam, offering unlimited upload and storage. The service, which has over 8 million photos stored, syncs with Flickr, Picasa, Photobucket and Facebook. Moore is expanding to the mobile sector by developing a mobile ad network, mobile content and applications. It aims to be the leading online media services and web solution providers in Vietnam.